This frame and stucco apartment building is an excellent intact example of the Mission Revival style that was built in Los Angeles during the late 1890s thru the mid 1920s. Designed by Harry Monroe Banfield, this building helped to redefine the concept of apartment design in Southern California. The typical Los Angeles apartment had not been looked upon as a permanent living arrangement for anyone who was affluent or influential. Rather, it was considered to be a temporary home while a more permanent one was bought or built. Los Angeles had plenty of land and was rapidly growing to fulfill its destiny to become the West Coast megalopolis it is today. However, it was in the 1920s that planners began to realize that urban sprawl was taking people further from the central city. The concept of the luxury apartment, with a unit that rivaled the size of a private home and afforded the renter many of the perks and design elements of the finest hotels was a new concept in Los Angeles. The San Marino Villas was one of the earliest of these luxury buildings. Each unit was over 2,200 square feet and was well appointed with “expensive furnishings, including complete heating, ventilating and vacuum cleaning systems”, according to a July 22, 1923 Los Angeles Times article announcing the planned building. Those who lived in the building would use only the San Marino Street address without noting the lettered unit number. The attention to detail in this building is clearly one of the hallmarks of apartment design in Los Angeles. The original owner, Julius B. Weil, was an immigrant from Baden Baden, Germany, arrived in the United States at the age of 19 and fought on the American Frontier in the Indian wars from 1872 to 1877, while also acting as a correspondent for the New York World during the same period. He arrived in 1905 and worked as the City Auditor for Vernon. He was also active in his Indian War Veterans Post. The Weil Family lived in one of the apartments at San Mario Villas until he sold the property in 1927. Weil passed away two years later. The architect, H. M. Banfield, first arrived in Los Angeles in 1903, after working several years with the firm of Pond and Pond in Chicago, he worked for the next decade for several local firms, including Greene and Greene, Myron Hunt and Fred Roehrig, before setting up shop in Pasadena in 1912. 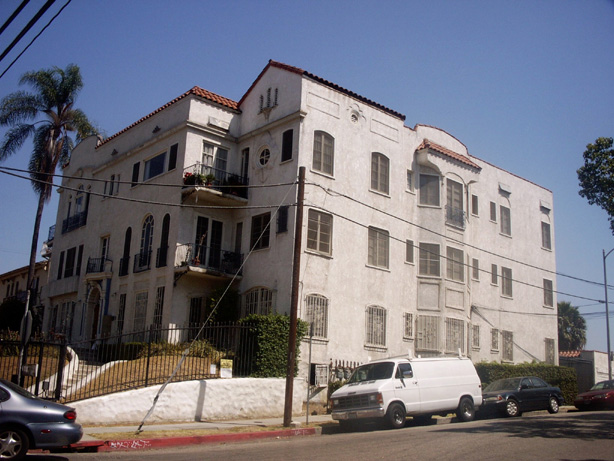 He moved his office to Los Angeles in 1919 and worked a number of high profile projects including the luxury apartment building at 3390 W. San Marino Street. In this building, one can see the influence of his California mentors, as well as Banfield’s own touch. In April 2014, the owner of the San Marino Villas (HCM #870) demolished the Mediterranean Revival apartment building without any permits.